Last night our local UPN (err, sorry…”My Network TV”) affiliate aired the first of the remastered Star Trek: TOS episodes, “Balance of Terror.” Of course, I was up at 11:00 checking it out. What did I think of the upgraded appearance? Here are my impressions. First of all, we have crappy analog cable. Second of all, our cable is fuzzy. As such, the picture quality was totally underwhelming, so I can’t even develop an opinion of whether the new digital picture restoration was any good. However, the new special effects and model shots came through all the snow loud and clear, and I was completely impressed. 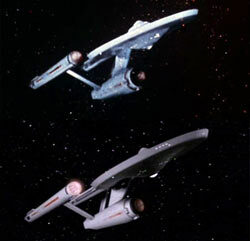 Both by the level of restraint the CBS team showed during their remastering, and by the new effects and model shots they chose for the premier episode. To the right is a comparison shot from “Balance of Terror” (someone else captured it off their satellite dish or HD receiver, obviously, because there’s no way I can receive anything on our shitbox cable that looks anything like that). The ship on top is the original 16mm effect shot from a TOS DVD, and the one on the bottom is the new CGI Enterprise in all her glory. The color is obviously more neutral — in fact, that’s probably the only thing I didn’t really like — but overall they seem to have made the classic E look sleeker and much sharper. What you can’t see about the picture above is that, during the scene in question, the ship had just been hit by a warhead and was basically listing. In the remastered episode last night, the ship was shown to be actually drifting while in the original effect shot, it was just hanging there, fixed in place. It’s the little details like this which added a lot to the presentation last night. Overall, though, the episode has been changed very little. In fact, almost every effects shot has been redone exactly as it originally appeared — from the same angles and all. This gives the new CGI a “non-distracting” feel which makes it flow perfectly naturally with the rest of the episode. There were exceptions, however. Whenever the original episode used a stock footage model shot from earlier in the hour, the CBS remastering team took the liberty of shooting their models from an entirely new, never-before-seen angle. The “overhead chase view” of the Romulan warbird, showing off the armor plating on its hull, was astounding, as was the new close-up of the Enterprise’s saucer. My favorite “upgraded” effect of the episode, though, wasn’t a ship. It was the comet. At one point, the Romulan ship flies toward a comet, and Kirk & Company try to catch him as he goes through. The comet’s icy, animated appearance was simply astounding. It’s nothing that we wouldn’t expect from a modern day sci-fi show, of course, but seeing it spliced onto the TOS bridge viewscreen was so incredibly cool, I thought I would die. 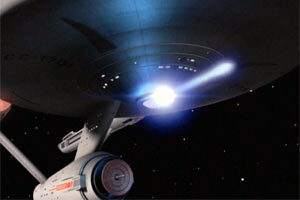 The only updated effect I did not really like was the new Romulan plasma weapon. It reminded me of the fireballs thrown by the imps in the original Doom; seemed like it could have looked better. It didn’t put a damper on my enjoyment of the episode overall, though. December is Retro Gaming Month (Mk II)!